If you've ever been in a theater filled with children, you know what a nightmare it can be to get them to sit through an entire two-hour film without blabbering on, bursting into tears, or loudly fidgeting like a nervous puppy. In short, it's a miserable way to watch a movie. 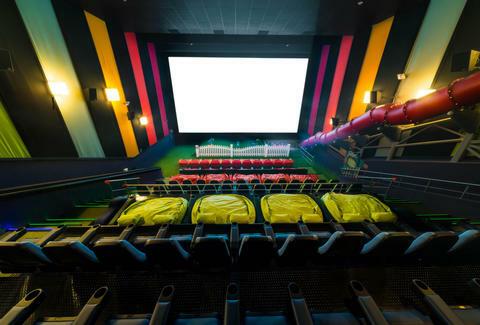 Now, a Mexican movie theater chain is setting out to fix the problem here in the States, by switching out traditional auditorium seats with full-on indoor playgrounds, where kids can go buckwild while their parents sit back and relax. Mexico's Cinépolis just announced it will be opening a series of theaters in Southern California later this month, explicitly designed with an audience of children in mind. That means that rather than feature rows and rows of traditional comfy seats or recliners, there will be a small section of seats tucked behind a large astroturf play area, complete with two large slides, a mini merry go-round, pogo sticks, enormous suspended bean bags. tire climbers, and "molded plastic animal sculptures," where rambunctious kiddos can tire themselves out as the latest Pixar or Disney flick projects on a screen before them. Even more incredible, they're considering leaving the house lights on the entire time, so kids can easily see as they play. There's nothing new about movie theaters using gimmicks to bring in crowds. Consider drive-ins and the number of chains that now offer full meal and drink service throughout your screening. However, this radical plan to encourage would-be budding cinephiles to treat the movie theater like a 2-hour schoolyard recess has ruffled some feathers. Many argue that it will teach young kids that being disruptive during a movie is no big deal, and ultimately usher in a generation of loud, rude movie-goers. Of course, parents may feel differently, as these places will most certainly be a place of refuge for families with lots of little ones. It's important to note, though, that Cinépolis made clear these special theaters will only be screening kid-friendly flicks, so there's no reason to worry that you'll be interrupted by hordes of rambunctious 5-year-olds swinging around in front of the screen when you go to see Ghost In The Shell. Joe McGauley is a senior writer for Thrillist. Follow him to blissful texting-free screenings @jwmcgauley.